Customers are getting more demanding and want better service for lower costs. Companies respond and adopt methods for improving the effectiveness and efficiencies of their key processes. Many companies choose to hire consultants to map their processes, identify improvement opportunities and implementation plans. Careful! This could end up in a large program, costing a lot and taking a long time. And it is not always needed! A pragmatic smaller approach can also bring results in a short period of time. A wonderful example was shown by a large Dutch city. The Claims team of the city received too many complaints about their own performance; citizens complained about the response times, employees experienced stress and extra work was done by the call center trying to answer calls from citizens requesting a status update. The team was looking to improve its own performance and asked the internal consulting team for support. The internal consulting team organized a meeting with a representative of each role involved in the complaints process. From the first call-center team to the final assessor and administrator; everyone was represented. Together they started mapping the process, step by step, and asked themselves, What happens next? How long does that take? What else is done? 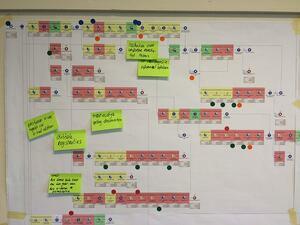 After they mapped the complete process, the team went over each process stepped again. This time they scored each step whether this specific step was customer value added; if so, it was colored green. If the step was not-value added, it was colored red. If it was not value added, but necessary for internal reasons, it was colored yellow. Mapping the process and scoring the process steps was done in an online process tool. It allowed the team to first score every process step, and then zoom-out to look at the overall picture. The team was shocked by their own result. More than 50% of their activities was scored red as non-value added by themselves. After the initial shock the team decided to see this as an opportunity. They got to work and started to streamline their own process; within a couple of weeks the efficiency and effectiveness of the process improved dramatically. The service to the citizens improved, the costs were lower and the team felt good in doing less un-necessary work. The example given shows that process improvement does not always require large and expensive projects. A pragmatic approach can quickly highlight bottlenecks and give improvement opportunities. If you want to know more about this case or the methods used, please don’t hesitate to contact us.